In order to receive CompTIA A+ certification a candidate must pass two exams. 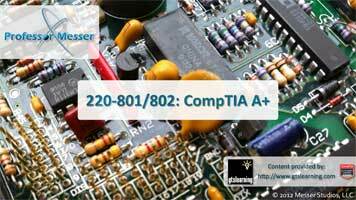 The first exam is the CompTIA A+ 220-801 Certification Exam. The CompTIA A+ 220-802 Certification Exam is the second exam required in order for CompTIA A+ certification candidates to complete their certification. The CompTIA A+ 220-802 examination measures necessary competencies for an entry-level IT professional with the equivalent knowledge of at least 12 months of hands-on experience in the lab or field. Successful candidates will have the knowledge required to assemble components based on customer requirements, install, configure and maintain devices, PCs and software for end users, understand the basics of networking and security/forensics, properly and safely diagnose, resolve and document common hardware and software issues while applying troubleshooting skills. Successful candidates will also provide appropriate customer support; understand the basics of virtualization, desktop imaging, and deployment. CompTIA A+ is ISO 17024 Accredited (Personnel Certification Accreditation) and, as such, undergoes regular reviews and updates to the exam objectives. The following CompTIA A+ 220-802 certification exam objectives result from subject matter expert workshops and industry-wide survey results regarding the skills and knowledge required of an entry-level IT professional. The percentages in this document represent the relative importance of the subject areas (domains) in the associated body of knowledge, and together establish the foundation of an entry-level IT professional. Candidates are encouraged to use this document to guide their studies. The table below lists the domains measured by this examination and the extent to which they are represented. The CompTIA A+ 220-802 certification exam is based on these objectives. CompTIA is constantly reviewing the content of our exams and updating test questions to be sure our exams are current and the security of the questions is protected. When necessary, we will publish updated exams based on existing exam objectives. Please know that all related exam preparation materials will still be valid.